The Battle of Orthez took place on 27 February 1814. After the fierce fighting through the Pyrenees, storms and torrential rain prevented any action for two months. Researching the second half of the war for my Peninsular War Saga is interesting. When I did the first trip through Portugal and Spain last year, I had already written four and a half books in the series in draft form. I knew where my fictional regiment was going to be during every battle and it was a matter of checking my research against actual locations to be sure that my story would work. Eventually Wellington cut off Bayonne when he crossed the Adour to the west of the city. 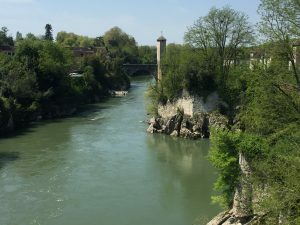 Soult believed that the Allied attack, which required them to cross rivers, would be held up due to a lack of boats or pontoons but on 23 February, Hope sent eight companies from the 1st Division across the Adour to form a bridgehead. During the evening, two French battalions were sent to investigate and were dispersed with the use of Congreve rockets. The following day, 34 vessels of 30 to 50 tons were sailed into the mouth of the Adour, moored together and a roadway built across their decks. By the evening of 26th, Hope had marched 15,000 men over the bridge onto the north bank. The Allies successfully captured the Sainte-Étienne suburb with a loss of 400 dead and wounded to the French 200 and encircled Bayonne on 27 February. From then on a very relaxed siege was maintained until 14 April when a French sortie led to the the bloody and pointless Battle of Bayonne at the end of the war. Wellington pursued Marshal Soult’s army eastwards, away from Bayonne. Soult’s army was already weakened and Wellington hoped to divide them further while Soult hoped to trap the Allied army within French occupied territory. Bayonne blocked the north side, three French divisions held a line along the Adour to Port de Lanne and the east was held by four French divisions along the Joyeuse River to Helette. From there into the Pyrenees, Soult’s cavalry patrols closed the cordon. Wellington started his offensive towards the east on 14 February. 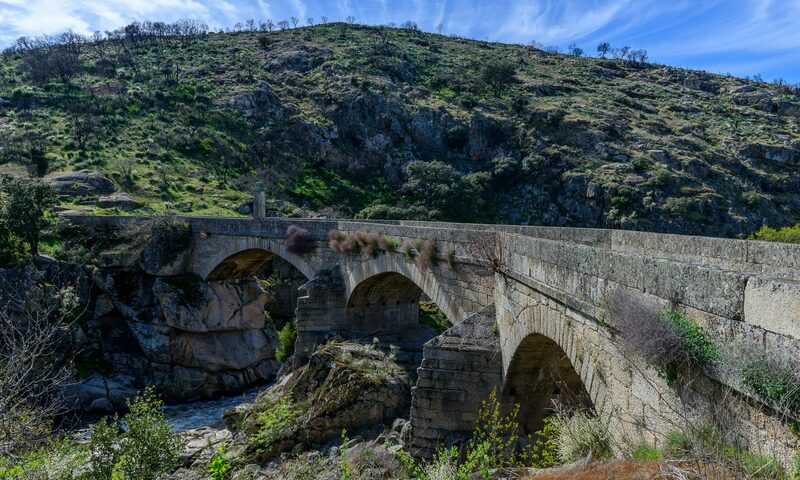 Hill’s corps took the right flank, including the second and third divisions, some Spanish and Portuguese troops and Fane’s cavalry while Picton took his men down the left flank and Morillo moved through the foothills on the right. On February 15 Hill defeated Harispe’s division at Garris and forced the French back. Beresford’s left flank corps advanced the following day towards Bidache. It consisted of the 4th, 6th, 7th and Light Divisions as well as some cavalry. Over the next two days both sides manoeuvred their troops. The French had greater numbers but Soult sent Abbé’s division to help defend Bayonne, a move which left his army with fewer troops to fight Wellington. By 18 February, Soult had his troops in position on the Gave d’Oloron at which point the weather broke again, causing another delay in operations. On 24 February, Wellington launched a new offensive. For this operation, Hill was reinforced by the 6th and Light Divisions. Beresford with two divisions mounted a feint attack against the northern end of the French line. Picton was supposed to do the same opposite Sauveterre but he exceeded his orders, having found an apparently unguarded ford about 1,000 yards from the bridge. Picton decided to send four light companies from Keane’s brigade across. After a steep climb, they reached high ground only to be overpowered by a battalion of the 119th Line Infantry from Villatte’s division. In their flight down the slope and across the river, they lost about 80 of the 250 men who were either killed, captured or drowned. Somewhere in my head I could hear the ghost of Robert Craufurd laughing, remembering Picton’s refusal to support him during his own unauthorised crossing at the Coa in 1810. Meanwhile Hill built a boat bridge and sent 20,000 troops across the Gave d’Oloron at Viellenave de Navarrenz, a move which led Soult to pull back to Orthez. Wellington was not particularly keen to fight a battle at this point and tried to outflank the French, sending Beresford to cross the Gave de Pau downstream at Lahontan to circle around Soult’s right flank. At the same time, Hill’s corps moved directly toward Orthez. By 25 February, Soult had gathered his army at Orthez and was ready to fight the Allies. The French marshal commanded 33,000 infantry, 2,000 cavalry, 1,500 gunners and sappers with 48 field guns. Wellington had 38,000 infantry, 3,300 cavalry, 1,500 gunners and sappers, supported by 54 guns. With Soult ready to fight, Wellington intended to send Beresford to break Soult’s right flank while Picton and three divisions attacked the French centre. Meanwhile, Hill’s corps was to attack Orthez, get across the Gave de Pau and attack the French left flank effectively crushing Soult between Beresford and Hill. Orthez is a pretty little town with the Gave de Pau running from southeast to northwest. Since Beresford was already on the same side of the Gave de Pau, the river only protected Soult’s position to the east of Orthez. However, there is an east-west ridge on the north side of Orthez that ends at the village of St Boes to the west. It rises to about 500 feet with the road running along the crest, with threeknolls rising even higher, as far as 595 feet above the village. These knolls held French artillery. 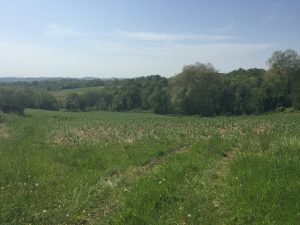 Soult posted four and a half divisions along this ridge, one division in Orthez and one division in reserve. Going from right to left, the ridge was held by the divisions of Taupin, Claude Pierre Rouget, Darmagnac and Foy. Rouget was in temporary command of Maransin’s division. Harispe’s remaining two brigades held Orthez while Villatte’s division was in reserve north of Orthez. Reille commanded Taupin, Rouget and Paris on the right flank, Drouet commanded Darmagnac and Foy in the center and Clausel had Harispe and Villatte on the left flank. The cavalry was scattered. Wellington planned to send Cole’s 4th Division supported by Walker’s 7th Division to attack the western end of the ridge under the direction of Beresford. Picton would lead his own 3rd Division and Clinton’s 6th Division in attacking the French centre and Hill’s corps was to feint against Orthez with a Portuguese brigade and hold his two divisions ready to cross the Gave de Pau to the east of Orthez. Charles von Alten’s Light Division was placed under cover behind the old Roman camp where Wellington set up his headquarters located between Beresford’s and Picton’s columns. It was frosty but not frozen on the morning of 27 February, difficult for me to imagine yesterday, exploring the battlefield in soaring temperatures. At 8.30 the 4th division attacked Taupin at St Boes and quickly seized the church. Ross’s brigade swept into the village but were driven back by the battery on the Plassotte knoll. Cole brought up a KGL battery to duel with Taupin’s guns. This immediately became the target of the French batteries on the Plassotte and Luc knolls; two guns were hit and Captain Sympher was killed. Cole deployed a Portuguese brigade on Ross’ right and sent his line forward again. The result was a second repulse in which Ross was wounded and the counterattack by Taupin’s troops recovered part of St Boes. For a time there was a lull as the two sides fired away at each other from the houses, but the Portuguese had no cover and began to fall back. Wellington sent over the 1st Caçadores Battalion from the Light Division. Cole’s line collapsed just as the reinforcements arrived and Taupin recovered the entire village and drove the Allies back to their starting point. Ross’ brigade suffered 279 casualties and the Portuguese brigade lost 295. Picton’s attacks against the French centre also met stiff resistance. He had split the 3rd Division, sending Brisbane’s brigade up the right spur towards Foy and Keane’s brigade up the left spur toward Darmagnac’s division. Keane was supported by Power’s Portuguese brigade while Brisbane was followed up the right spur by Clinton’s 6th Division. Since the valleys between the spurs were deep and muddy, both advances were restricted to narrow fronts. Picton’s skirmishers quickly drove back the French outposts. When the leading brigades came under accurate artillery fire from the Escorial and Lafaurie knolls, Picton held back his formed troops and reinforced his skirmish line to seven British light companies which moved forward until they came into contact with Soult’s main line where they were unable to advance any further. For two hours, Picton waited for Beresford’s attack as the two sides skirmished. Wellington adjusted his plans after seeing his flank attack fail converting his holding attack with the 3rd and 6th Divisions into a full assault beginning at 11.30am. He threw every available unit against the French right flank and centre, holding back only the second and third battalions of the 95th, the Portuguese 3rd Caçadores and the 17th foot. He also withdrew the battered brigades of Ross and Vasconcellos and sent in the 7th Division. The struggle for St Boes began again when Walker’s division and Anson’s brigade attacked supported by two batteries firing from the church knoll. Taupin’s tired men, who had been fighting for about four hours, were driven back behind the Plassotte knoll. Brisbane’s brigade came under damaging artillery fire. The brigade finally reached dead ground where the guns could not hit them, but then came under intense fire from French skirmishers who began picking off the soldiers. Nevertheless the 45th fought its way close to the top of the ridge where Fririon’s brigade of Foy’s division held the ridgeline. On the left of Brisbane’s brigade, two companies of the 88th were guarding the divisional artillery battery as it began pounding the French line. Soult spotted the threat and ordered a cavalry squadron to charge. The cavalry overran the two companies, inflicting heavy losses, and then went after the gunners. The remaining companies of the 88th immediately opened fire on the French horsemen, mowing most of them down to a loss of 165 men. The 88th suffered the highest casualty rate of any British unit at 269 killed and wounded. At this point, Foy was wounded by shrapnel in his shoulder which affected the French morale. Brisbane’s brigade was replaced in the front line by two brigades of Clinton’s 6th Division. These fresh troops fired a volley from close range and advanced with bayonet, driving the French down the ridge’s rear slope. Berlier’s brigade of Foy’s division fell back after Fririon’s retreat exposed its flank. With Berlier gone, Harispe’s two battalions in Orthez were compelled to retreat in order to avoid capture. On the left spur, Picton’s two brigades under Keane and Power pressed against Darmagnac’s division. After Foy’s division gave way, Darmagnac retreated to the next ridge in the rear, where his troops took position on the right of Villatte’s division. The divisional batteries of Picton and Clinton immediately attacked the new French position. Rouget’s division and Paris’ brigade began to pull back after Darmagnac’s retreat which opened a gap between Rouget and Taupin. Wellington ordered the 52nd under Colborne to advance from the Roman Camp and drive a wedge into the French defensive line. Colborne led his men across marshy ground and then up the slope toward the Luc Knoll, winning a foothold at the top of the ridge on Taupin’s left flank. Wellington led the 3rd and the 6th in behind them and musket volleys created havoc in the French ranks. In the thick of the fighting, Wellington’s Spanish liaison officer, Alava was hit in the buttocks by a spent bullet. As Wellington was teasing Alava, he was knocked off his horse when a spent ball struck his sword hilt, bruising his hip. Wellington remounted and continued to direct the battle. Against the advice of his doctors he ignored the injury with the result that he was later unable to ride for a week. With both flanks turned, Taupin’s division retreated in haste to the northeast, the last French unit to be driven back. To the rear, Rouget’s division and Paris’ brigade joined together and fought a hard battle against the pursuing Allies. Buchan’s brigade skirmished with the French defenders of Orthez all morning. 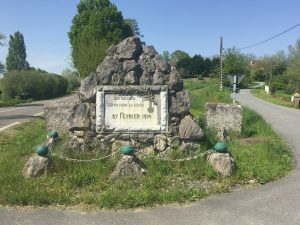 Having received orders to cross the Gave de Pau, Hill marched for the Souars Ford at 11:00 am and brushed aside the French troops defending the ford. Hill’s troops were soon across the river in strength and pressing back Harispe’s outnumbered division. They were joined by Buchan’s Portuguese who crossed at the Orthez bridge the moment the town’s defenders pulled out. Joined by some newly arrived conscript battalions, Harispe attempted to make a stand at the Motte de Tury heights but the raw recruits were too inexperienced and Hill’s men broke Harispe’s line and captured three guns. By now Soult had realized that Hill’s column might cut him off and ordered a retreat which began well but quickly disintegrated into chaos down narrow paths and across country. Soult had lost six field guns and 3,985 men including 542 killed, 2,077 wounded and 1,366 prisoners while the Allies sustained losses of 367 killed, 1,727 wounded and 80 captured for a total of 2,174. In addition, many of the recently conscripted French soldiers promptly deserted. Soult did not attempt to defend the Luy de Béarn with his demoralized army but retreated north to Saint-Sever on the Adour. Soult realised he could not defend both Bordeaux and Toulouse. He decided to head for Toulouse. Wellington sent Beresford with two divisions to take Bordeaux which Beresford did on 12 March. There was a brief lull in the fighting while Wellington sent for more troops and Soult ’s men recovered. When the Allied army finally marched towards Toulouse, they were marching towards the end of the war. Orthez is just over thirty miles to the east of Bayonne, a pretty little town on the river Gave de Pau. The original bridge, with its distinctive sentry tower in the centre, is still there and can be seen from the modern bridge. 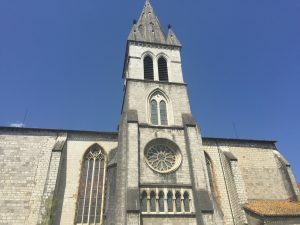 We drove through the town to view Wellington’s deployment area up past the church and then drove up towards Baights de Bearn to see the spurs where Picton’s men would have been deployed to the right of the road. Further on it is possible to view the ridge to the right which the Light Division used to climb up to the village. The location of St Boes has apparently changed since the battle but the church marks the area where much of the fighting took place and it is possible to walk down the road towards the Roman Camp to see where the Light Division was engaged. Turning right after St Boes we drove along the ridge held by Soult’s men. The 52nd would have climbed up the gulley to the right to appear between Taupin and Rouget’s division. It doesn’t look like a particularly easy climb and given the time of year it may well have been very boggy. 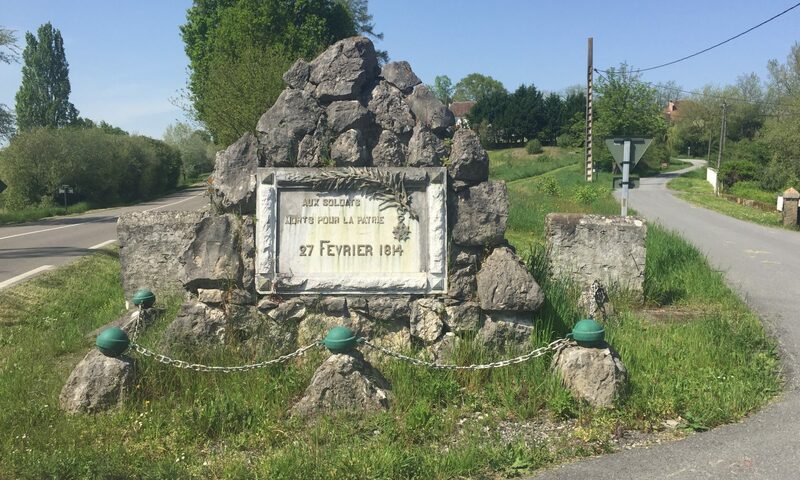 There is a memorial to General Foy’s men on the left-hand side further along the road. Having flown into Toulouse to begin this trip, for convenience sake, we are doing the battlefields backwards. By this time Soult was very much on the run, his troops battered and exhausted with many desertions among the new recruits. But at the beginning of Wellington’s attacks on the Pyrenees the matter was by no means certain. Tomorrow the plan is, to visit some of the sites of the Battle of the Nive.